A VIEW OF OUR OIL/ GAS FIRED BOILER. Extra large heating surface decreases thermal stresses on tubes resulting in long life of the boiler furnace & tubes. Large heating surface enables the boiler to safely handle high TDS water quality resulting in fewer blows down and heat losses. Large heating surface reduce friction of flue gases re­sulting in negligible erosion of smoke tubes. Large heating surfaces reduce flue gas temperature to just above steam temperature. This low pinch point drastically improves boiler efficiency and reduces dry flue gas losses through Chimney. Large water holding within the boiler shell results instablebo iler pressure inspite of fluctuating loads from the process. Steam is flashed within the boiler without addition of extra heat resulting in very negligible pres­sure drop within the boiler. As the boiler need not modulate frequently through increase/decrease in fuel consumption, the boiler, furnace and tubes are not thermally stressed or subjected to ther­mal shocks. Large steam and water space results in excellent quality of steam. Typical dryness fraction of steam is 0.98 which cannot be matched by any other boiler. Dry steam reduces the processing time, saves steam and improves quality of processed goods. As staggered tube design is given, water circulation is controlled effectively, water rising towards the surface while it is heated and then proceeding towards the steam space. This results in faster generation of dry steam. Over and above the upward movement prevents the corrosive CO2 and O2 bubbles from pitting the tubes thereby dras­tically improving their life. A collection zone given at the bottom of the boilers drum having no heating surface such as tubes in the zone allowing for collection of TDS in this zone hence enabling the boiler to operate at higher TDS levels in the boiler. Large heating surface enables the boiler to safely handle high TDS water quality resulting in fewer blow down and heat losses. Hinged doors are provided for the rear and front smoke box chambers which makes easy access to heat transfer surfaces for cleaning and inspection. 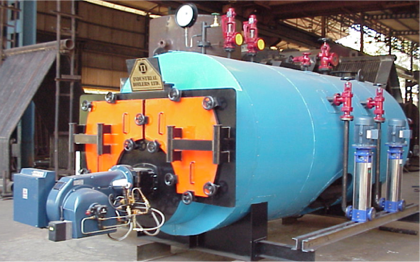 IBL offers a unique design of 3 pass full Wet back Smoke Tube Boilers with center furnace hence internal inspection and cleaning of the water side can be easily done. Adequate Man hole at the top and Mud holes at the bottom are conventionally placed to have easy excess in the boiler for cleaning from water side. A Fusible plug is provided in the Reversing chamber Top in order to melt in case of low water level below the chamber.A Fusible plug is also provided in the Tube plate top zone in order to melt in case of low water level below the tubes. Automatic water level controlling device is provided with each Boiler to start and stop the feed pump with respect to water level in the boiler. In case of extreme low water the boiler will go out in a lock out condition an Audio & Visual alarm will also be trigged. In case of high steam pressure two safety valves are provided to relieve the In case of high steam pressure Two safety valves are provided to relive the excess steam pressure. Two easing leavers are also provid­ed to vent of steam manually and check the working of the valves. A pressure switch is provided to start and stop the boiler at the desired pressure. 100 % radiography examination for longitudinal and circum­ferential seams of shell are carried out .Dye penetration test is carried out for each and every bud joint to avoid all welding flaws. IBL’s compact design requires less space and is easy to install as no special foundation is required. We hope that our offer meets with your requirements and we now look forward to receive your valued order at an early date. Should you need any further techno-commercial information, please feel free to write to us. Multifuel FBC boilers. Hi-Pressure Co-Generating systems. Manual Coal / Lignite Fired boilers. Oil / Gas Fired boilers. Agricultural Waste Fired boilers Waste heat recovery boilers. Urjash Burner Systems. Water Treatment Plants. Air Pollution Control Systems. Incinerators. Hot Air Generators. Heat Recovery Systems. Boilers offered are designed and manufactured conforming to the latest Indian Boiler Regulation and are of Class I Fusion welded, ensuring stringent quality control at every stage of manufacture, right from raw material stage to the testing prior to dispatch. The pressure parts are constructed from Boiler quality steel plates, fully welded, shell 100% radiographed and hydraulically tested. One Main Steam Stop Valve on Boiler. Two Sets of Water Level Gauges with Protectors. UV cell to Control Flame Failure. Pressure Switch to stop or start the Boiler at desired pressure differential. Two numbers electrically driven multistage centrifugal feed pumps (one duty and one stand by) with motor is included in our scope of supply. Feed Water regulating system to ensure correct water level in the Boiler will be provided. The system is complete with low water level alarm. IBL Indigenous Fully Automatic Pressure Jet, forced draft, Burner with nozzle, ignition transformer, electrodes, diffuser plate, oil pressure gauges, solenoid valves UV is provided. A Non Pressurized Non IBR feed water heater is provided to recovery heat from the exhaust flue gases and heat the feed water supplied to the boiler. An air pre heater is provided to recovery heat from the exhaust flue gases and heat the air for combustion to the boiler. The doors are hinged both at the front and rear and are insulated with high resistance refractory. Burner Block is also insulated with specially made high refractory. The boiler mounted on chair is provided with platform conveniently placed to give access to the top part of the shell for easy operational as well as maintenance condition. Flue duct between boiler / HRU / chimney. Feed water tanks, feed water piping upto the feed check valve & feed pumps on the boiler & HRU unit. Steam blowdown, drain and other piping from terminal valves on the boiler. Electrical work in the boiler houses upto the terminal points and interconnecting cables. All civil and structural design work OR civil and structural work for installing the boiler. Instrumentations and accessories for performance test. As the Boiler is supplied as a package unit there is not much erec­tion work to be carried out. However, if required by the client we can arrange to send our Service Engineer at an extra cost to assist in the erection and commissioning of the boiler. A complete set of Drawings and Documents certified by the Inspecting Authority of the State of its origin will be furnished by us within 4 to 6 weeks from the date of dispatch of the Boiler unit. * All information is in approximate figures, our design being under constant improvement. The above information is subject to change without notice. - Outlet of main steam stop valve. - Outlet of safety valve and vent valve. - Outlet of respective valves. - Outlet of individual items such as : Boiler / HRU. on the motors controls, Instruments etc. Main Steam Stop ValveSant Leader/Equiv. Safety ValvesDarling Musco Fainger Lesser / Equiv. Pressure Gauge Baumer / Equiv. Water Level Gauges with Protectors Leader/Sant/ Sharp/Equiv. Blow Down Valve Levcon/ Sant/Equiv. Feed Check Valve Sant /Leader/Equiv. Feed Pumps Lubi / Equiv. Mobrey Control Malhotra / Equiv. Motors Crompton / ABB/ Equiv. The above makes are indicative and are usually supplied by IBL. The above are supplied subject to availability at the time of delivery. MECHANICAL SAFETY FOR LOW WATER. A Fusible plug is provided in the Reversing chamber Top in order to melt in case of low water level below the chamber. A Fusible plug is also provided in the Tube plate top zone in order to melt in case of low water level below the tubes. ELECTRICAL SAFETY FOR LOW WATER. A Automatic water level controlling device is provided with each Boiler to start and stop the feed pump with respect to water level in the boiler. MECHANICAL SAFETY FOR HIGH STEAM PRESSURE. In case of high steam pressure Two safety valves are provided to relieve the excess steam pressure. Two easing leavers are also provid­ed to vent of steam manually and check the working of the valves. ELECTRICAL SAFETY FOR HIGH STEAM PRESSURE. A pressure switch is provided to start and stop the boiler at the desired pressure. In case of high steam pressure a pressure switch is provided to stop the boiler at the desired pressure. ELECTRICAL SAFETY FOR FLAME FAILURE. A Photo Cell is provided to stop the boiler in case of an flame failure and put the boiler in lock out condition. 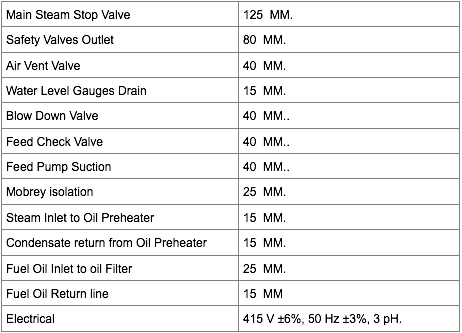 Note: - The above figures are approximate. Our designs are under constant improvement and are subject to change with out notice.